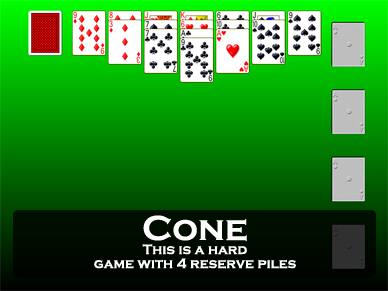 Screen shot of the game Cone from Pretty Good Solitaire. 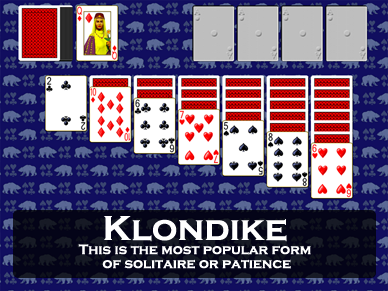 Cone is an offbeat two deck Klondike type game. There are four foundation piles. They are to be built up in suit from Ace to King, wrapping to Ace and then to King again, until each pile contains 26 cards. There are seven tableau piles. The tableau piles are built down by alternate color, wrapping from Ace to King if necessary. Move groups of cards if they are in sequence down by alternate color. Spaces may be filled by any card or group of cards. At the start of the game one card is dealt to the first and seventh piles, two cards to the second and sixth, three cards to the third and fifth piles, and four cards to the fourth pile. The remainder of the cards form a stock. Clicking on the stock deals one card to each tableau pile, but all piles in the tableau must be filled before clicking. vWhen only four cards remain, one card is dealt to each of the reserve piles. There are no redeals. Finally, there are four reserve piles. Cards are dealt here from the stock when the stock contains only four cards. The cards are available for play on the foundations or tableau. There is no building on these piles. Cone is tough to win, an average player wins less than 10% of the time.